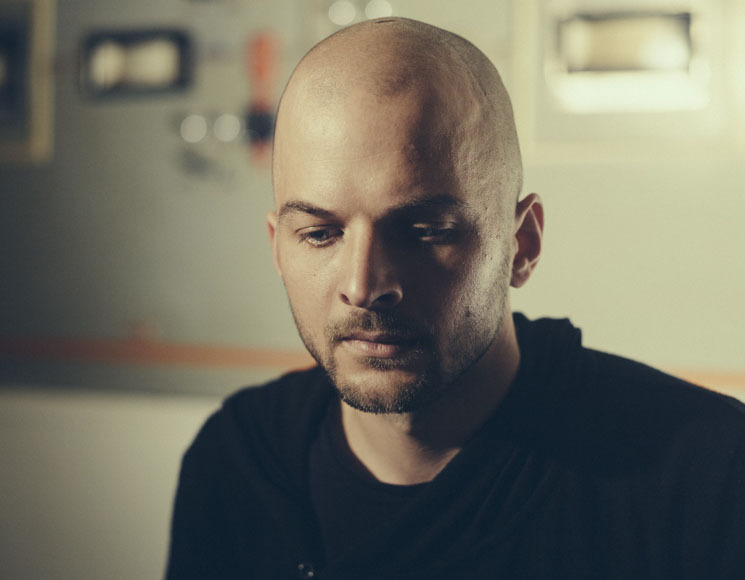 Nils Frahm has a lot of patience. For the past two years, the Hamburg-born composer has been embedded deep in Berlin's historic Funkhaus recording complex, restoring one of its classic studio spaces and labouring on All Melody, his first solo album in three years. When he takes a phone call with Exclaim! between rehearsals for his upcoming tour, he says he hopes his fans can lend it the same kind of indulgence. Online, there are live recordings of the title track that date as far back as 2014, but even when the album's release was imminent, he refused to offer it to anyone as a promotional single. In fact, there is no single. In one way or another, that was the point of making the record. "I'm strongly against this whole single/MP3 release schedule of artists nowadays," Frahm declares. "Judging an artist or the artistry of a musician today just by a three-minute piece feels a little bit difficult for me." Indeed, the version of "All Melody" Frahm included on his new double-album clocks in just under ten minutes, and most of the tracks surrounding it stretch beyond the six-minute mark, but Frahm's point is clear. For him, the glut of blog-exclusive single streams that pervade the industry is a mark of the crass commercialism of modern music consumption, siphoning out the artists that serve it in the process. No stranger to jamming against expectations, Frahm has never "toured an album," instead presenting live audiences with whatever material he imagines for the space, improvisationally "remixing" his piano-centric pieces like a DJ every night, as likely to give a seated audience a set of electronic dub as he is to bring an intimate piano master class to an open-air festival. It's as much about keeping listeners on their toes as it is honouring form, content, and situational dynamics. He crafted All Melody with a similar goal in mind. "I wanted to incorporate these compositions in a broader context, which I felt should be a bigger album kind of a journey, where you manage to climb up that road, which leads to these peak moments." It shouldn't be as revolutionary as it is, but in a time age when festivals are dominated by legacy acts touring classic albums and casual listeners (most of us) are more likely to identify the playlist they know a track from than the album or even the artist, these are visionary, disruptive tactics. Frahm says artistry has been devalued in the race to keep up with the zeitgeist, so he envisioned All Melody with an eye to a different time. "I feel like it is kind of a great innovation from the '70s or even the '60s, slowly going to the long-play thing and having hi-fi and all that," Frahm philosophizes. "I feel that there was a golden age of making albums, which reminds me of the golden age of classical music when composers were making symphonies, which are highly complex musical projects which basically showcase the talent and capacity of an artist in the best possible way as far as I can see it." So it makes sense that Frahm chose to record the album at Funkhaus — a modernist, mid-century complex that could be easily mistaken for another one of the area factories, itself a monument to another time. Originally established as a campus for distributing the communist German Democratic Republic's state-run radio broadcasts in the region, its studio facilities were renowned amongst acoustics experts, but after the fall of the Berlin Wall, funding lapsed, and the operations began dismantling. Forgotten by time, it languished in a sleep state while resident producers and musicians worked quietly in its studios and rehearsal rooms throughout the '90s and 2000s, but the industrial proportions of the building made upkeep difficult, and it fell into a state of neglect until new owners came in with some investment money in 2015. That's when Frahm received an invitation. A curious ear and frequent innovations have made him a prefered producer and technician amongst the likes of Sarah Neufeld, Hauschka, and scores others, and Funkhaus wanted his help renovating Studio 3, a 600-square-foot space in the building's Block B, formerly utilized in recording chamber orchestra, big band, and solo piano performances. "Funkhaus is like my dream place," Frahm enthuses. He had already planned on developing an album around "All Melody," so he set about creating the perfect environment, custom-built to his specific needs. In describing the sessions for All Melody and the renovation process leading up to them, Frahm paints a portrait of an ascetic. Within the fortified solitude of the campus's thick, insular walls, for 18 months, he relinquished control of his social media accounts to his management, shaved his head, and devoted his attention to the tasks at hand. "I didn't Twitter, I didn't use Facebook, I was just basically trying to make the best I could in that time," Frahm reflects. "It's a big luxury to have so much time and it's a big luxury to not use Facebook and to not be distracted and to focus, really, on something really old school." Over the course of the first 14 months, he set about dismantling the space and repurposing it for contemporary use, an extensive undertaking that meant building a 48-channel digital system and a pipe organ from the ground up, as well as some more primitive handiwork. "I mean, the whole installation of the normal studio was expected, but I had to make new floors," Frahm reflects. He even oiled the ground-to-ceiling wood panels himself and restored the building's old reverb chamber — a cavernous, multi-floor network of naked concrete hallways, stairwells, and a high-ceilinged soundstage that studios can route audio through for natural reverb. Throughout the process, Frahm kept a running list of ideas, and once the studio was in functioning order, he got recording. "One of the experiments was to combine a choir with some drums and percussion," he says. He also rigged up an organ to function as if it were a drum machine. Offsite in Mallorca, Spain, he recorded in a well. "I had little ideas like that which I write down sometimes. I basically laid out all these ideas I had in front of me and decided that I need a lot of time to just try all of them and see what it would lead me to." He estimates he emerged with 50 or 60 demos of different pieces and compiled the record from that in the months leading up to his deadline. "I just pressed the button and said, 'Okay, let's see what we have,' and compiled the album a little bit like a DJ would try to make a sequence out of a certain number of records he has." The result might be the most boundaryless, maximalist survey of Frahm's practice yet, his signature mix of keyboard-driven acoustic and electronic implements working in tandem while his electronic impulses truly run free — pianos, organs, synths, drum machines, and natural acoustic environments working together to create a lyrical ambient narrative, hints of Reichian minimalism, dub electronics, and Vangelis's Blade Runner theme throughout, while "My Friend the Forest" and "Forever Changeless" provide welcome callbacks to the imaginatively recorded acoustic piano treatments Frahm offered on Felt and Screws. It's not the first time Frahm's gone to extreme, unprecedented lengths to bring the ideas in his head to life. For previous undertakings, his obsessively hands-on approach to music making has prompted him to sit down with production software programmers and commission custom instruments like a Frankenstein, MIDI-controlled organ built out of two others. After recording 2015's Solo on David Klavins' record 12-foot-tall upright, he had the celebrated piano maker construct a one-of-a-kind piano featuring just one string per note, regardless of range, while 2011's Felt had Frahm preparing his piano hammers with DIY dampers. "I just like building things with my hands," he says. "my whole obsession with real instruments is also that I can open them and use mechanical techniques to change the sound." For Frahm, finding himself in new challenges is precisely what makes music making worth the trouble. With All Melody complete and a busy touring schedule that stretches out as late as December, he says he's happy to leave Funkhaus behind while others get some use out of it. In fact, Frahm's not sure he wants to use the Berlin studio again for his own work. "My real talent is to basically overcome a certain type of problem, and I feel like this studio doesn't leave me with any problems anymore. I eliminated all of the problems I usually had, which is the reason why I was doing the things I was doing. So I'm a little bit afraid that the vastness of the possibilities would just freak me out." More comfortable in the field than behind a familiar desk, Frahm's determined to actively continue searching for new sounds and situations to make music in, reveling in the challenges they present. "For me, it's just liberating." All Melody is out now on Erased Tapes. Find all of Frahm's upcoming North American tour dates here.